Google is the most used search engine, and they also offer various services to get your site indexed and supported, therefor improving your search rankings. Also known as Google Webmasters, allows you to add your site and a sitemap. You can also see what people are using to search and find your site and the search performance of your site. And if you site has suspicious activity it will alert you. The easiest way to add your site is to add the code it gives you to the Yoast plugin, but you can also add it to the header file of you site if your theme gives you easy access to it. And click verify – it will then confirm you have the tag in. This then allows you to edit the information that shows up on the right of a Google search. The image below shows how the website comes up on the left and then more business information comes up on the right. Setting up the basic Google My Buisness page is simple, make sure you are signed into your google account (or Gmail account) and then go here you will go through the process of setting it up. You have the chance to select if your place of work has a fixed address or is mobile. You will have to do a verification of the fixed address – they send a card with a pin so it can be verified. 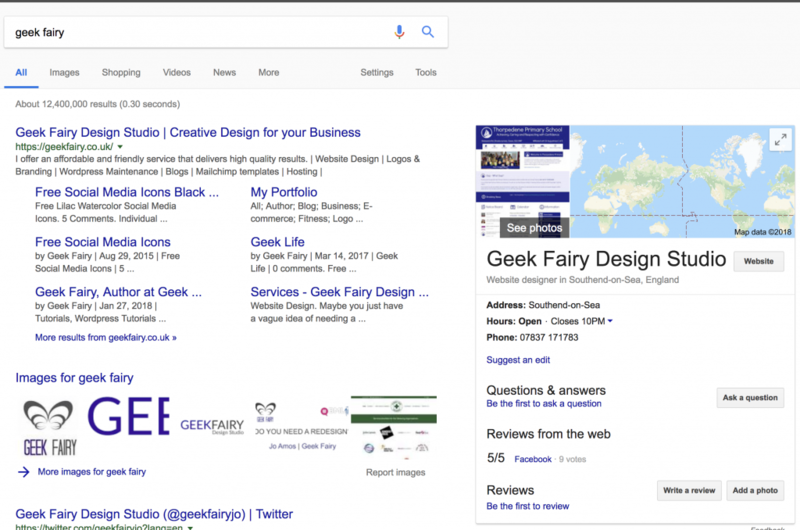 Having a Google My Business page means that people can find you easily, you can add photos and information about what you do. It will also show your reviews from FaceBook, and let others leave you direct reviews too. I use the Google Analyticator plugin on my sites to integrate Google Analytics as it gives you a widget on your dashboard to see your stats without leaving your WordPress site. First of all set up a Google Analytics account for your site, log into your Google account and click sign up. Go back to your WordPress site and add the Google Analyticator plugin and activate it. 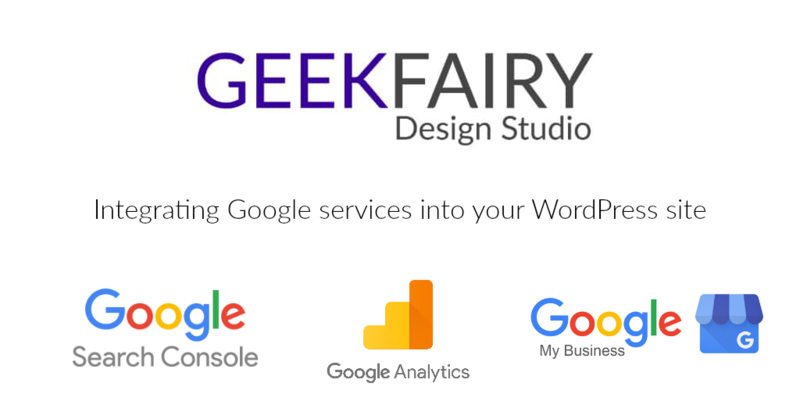 Go to the Google Analytics tab in your WordPress Dashboard on the left. Click connect to Google Analytics, copy and paste your code into the box and save and continue. 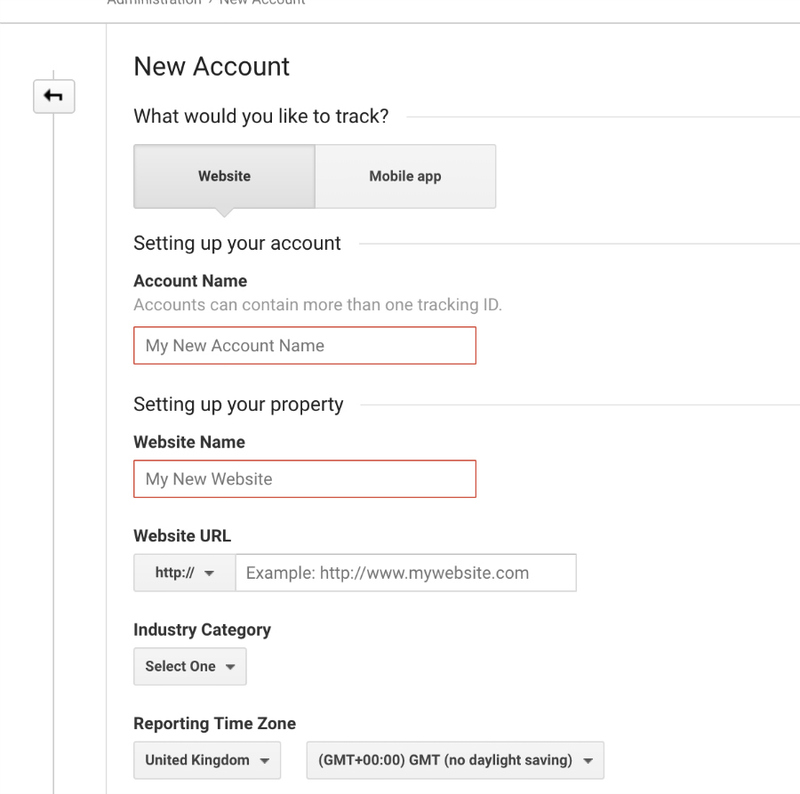 Then go to your Dashboard to see your stats, be aware if it is a new Google Analytics account it won’t track instantly. You can also go to your Google Analytics account here and see real time data and check it is all working. After 24 hours the widget on your dashboard should be showing your stats for the site. I also offer the service to do all the above for you.